Our neighbours recently gave us a desk they were getting rid of. I felt a little thank you seemed in order; I grabbed my trusty bowl and wooden spoon and knocked up a batch of these triple chocolate buns. The neighbours were delighted, especially their grandson, who I later learnt ate the lion’s share. As I made fifteen, there were a few extra for me and CT to try as well. This recipe for triple chocolate buns is super easy and very quick to make. You really don’t need a mixer. The results are good and chocolatey. They’re not too sweet, but have little bites of caramelised white chocolate and melting milk chocolate to liven things up a bit. The sponge is surprisingly light, given that they’re made with wholemeal flour. Rich chocolate buns with pieces of crunchy white chocolate and melting milk chocolate. Easy to make, they'll appeal to all. 1 tsp bicarb of soda. 250ml kefir, buttermilk or sour milk. Beat the eggs in, one by one. Sift in the dry ingredients and mix in alternately with the kefir. Spoon into 15 muffin cases. Bake at 180℃ for 20 minutes. These triple chocolate buns are my entry to this month’s #WeShouldCocoa. If you’ve made anything with chocolate and have blogged about it this month, do join in. They also go to Baking Explorer and Cakeyboi for this month’s Treat Petite. And I mustn’t forget Bake of the Week at Casa Costello. My #NationalChocolateWeek posts from this and previous years. If you like the recipe for triple chocolate buns, why not pin it for later? My goodness these look good! My kids would love them. Definitely have to bake these soon! Thanks for linking my cake up with your lovely post too, and I hope you’ve had a fantastic chocolate week! Thanks very much Elizabeth. The beauty of these buns is that they are quick and simple to make. Your spooky spider cake has made my Chocolate Week – it’s a stunner. Oh yes, I am all up for triple chocolate. Gorgeous! I’ll have to give these a try. 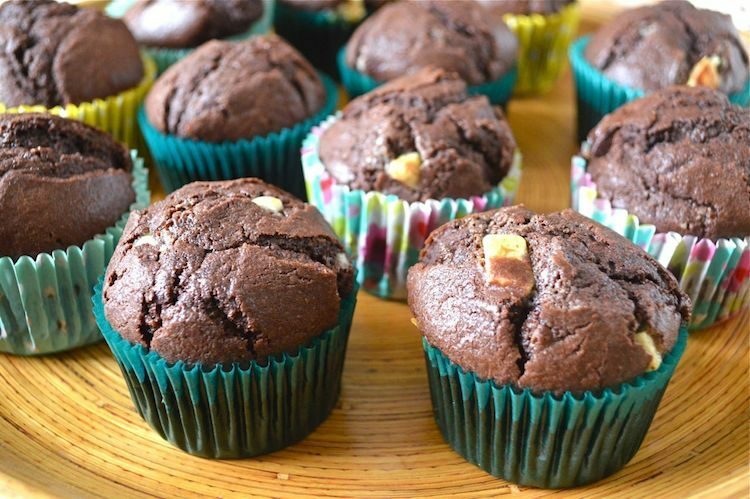 These muffins look so very chocolatey and bet your neighbours LOVE them. I certainly would too! such a lovely gift…very thoughtful and very jealous of your neighbours, these buns look delightful! triple chocolate, yes please! These look delicious! My boys and I would end up fighting over them if I made them! looks delicious… can you please suggest substitute for egg? Love these and know our 3 teenagers will too. 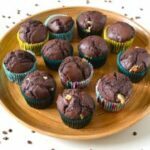 I have been increasingly trying to add more fibre into my sweet bakes and these fit the bill perfectly. Thank you for a great recipe. Thanks Sammie. Wholemeal flour gives a lovely flavour to bakes as well as adding fibre. Clearly I need more chocolate in my life with these buns!! They look amazing! As usual you’ve reminded me just how fine baking and chocolate are together. They look so lovely – just when I’m trying to be restrained in my eating for a week or two. I hadn’t noticed National Chocolate Week at all – I’m obviously missing out. Hello Phil. Lovely to hear from you. I’ve not been very good at being restrained recently and think I need to take a leaf our of your book. Even I was taken a bit unawares by National Chocolate Week this year – I’m losing my touch! These look awesome – the chocolatier something is the better, in my opinion 🙂 Love the white chocolate chips especially! Thanks Becca. White chocolate bits in small cakes are phenomenal as they tend to caramelise – yum! How did I miss the Chocolate Week? These buns look amazing, a true chocoholic’s dream. Thanks Natalie. Shockingly, I nearly missed chocolate week!